Infinite Ground is a highly original and confounding mystery. One night in a Latin American country a young man, Carlos, vanishes from a restaurant. No one sees him leave, and there are no traces of him anywhere. The detective hired to find him becomes absorbed with reports of Carlos's increasingly odd behavior before his disappearance. He supplants Carlos in his business and private life, believing that will help to find him, but when that doesn't advance the case he follows Carlos's trail deep into the tropical rainforest. There, solitary and obsessed, he is consumed by the wilderness around him, causing him to question his very identity and purpose. MacInnes blurs the line between reality and fantasy in his hallucinatory, compulsively readable debut novel. Martin MacInnes was born in Scotland. He has an MA from the University of York, has read at international science and literature festivals, and is the winner of a Scottish Book Trust New Writers Award and the 2014 Manchester Fiction Prize. He lives in Edinburgh. 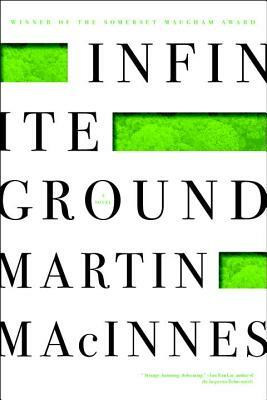 Infinite Ground is his first novel.